SWS Forestry Limited evolved from the South Western co-operative society which started out as an agricultural services company and was set up in 1957. The company evolved and developed over time and in 1986 SWS Forestry Limited was set up. We have strong links and history with the agricultural community having emerged from the Agricultural services company and we are now one of the leading forestry services companies in Ireland. We are investing in expanding our business and are seeking to recruit junior and senior foresters across all our regions. Additional team members are required to expand our planting programme, maintain existing plantations, service our existing client base and to develop new business opportunities. You will be expected to carry out those duties expected of a qualified forester and any other reasonable duties. Report regularly to the Regional Forestry Manager with updates on project progress, workloads, budget management etc. The Company may assign you to other appropriate duties at its discretion at any time during your employment which may include carrying out duties not listed above. Excellent remuneration package available, depending on candidates experience and ability. Regional Forestry Manager or General Manager (as appropriate). You will work as a forester in the Republic of Ireland and your primary area of focus will be the area you applied for. This may change from time to time and you may be expected to work and travel outside this area. The company head office is located in Clonakilty, Co. Cork and you will be expected to attend meetings and training there from time to time. 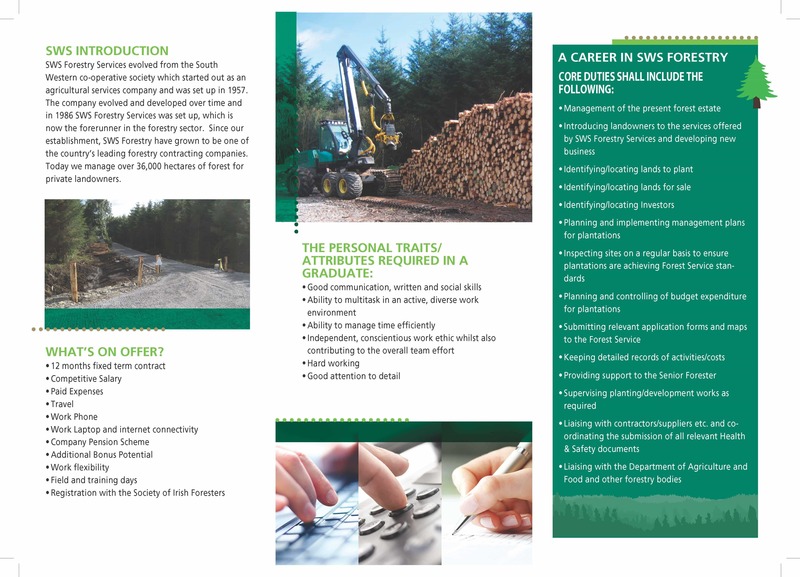 If you are interested in applying and joining the SWS Team as the company continues to grow please send CV’s and application letters to Careers@swsforestry.ie. 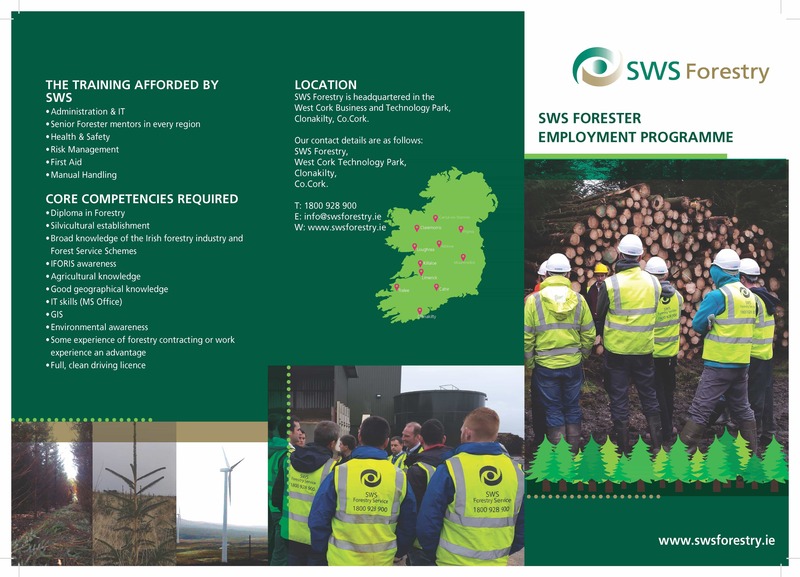 If you are interested in commencing or progressing your career with SWS Forestry Services, please send a current CV along with a cover letter to careers@swsforestry.ie We are always interested in hearing from enthusiastic, hard working people who are able to work independently whilst also contributing to the overall team effort. Check out our Forester Employment Brochure below. Click on the image to enlarge.